Windows Live Groups will no longer be available in OneDrive after October 16, 2015. All files in Groups folders also will no longer be accessible after that time. If you see Groups, then you are part of one or more Windows Live Groups - see the steps below to keep any files you have in those groups. If you don't see Groups in the navigation pane, you're not part of any Windows Live Groups, and there's nothing you need to do. 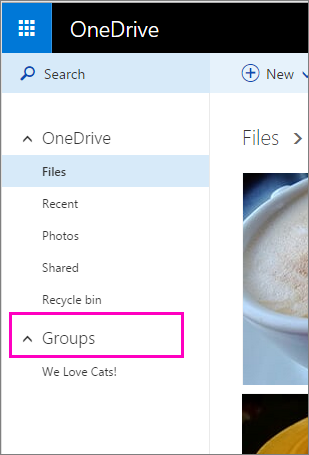 To keep your group files with OneDrive, download them and then move them into your own OneDrive. In the left pane, under Groups, select the group that contains the files you want to keep. Select the files you want to keep. Select Download. If you have files in multiple folders, you’ll need to download the files from each folder separately. Note: If you downloaded more than one file at a time, a .zip file is created to hold the files. To open it and remove the files, open File Explorer, browse to the .zip file (in the location you were downloading the files to) and right-click it, and then click Extract all. In the left pane of the OneDrive website, select Files to open your own OneDrive. Browse to the folder where you want to upload the group files, or create a new folder. In File Explorer, select the files you want to add to your OneDrive, and then drag them to your browser and drop into the folder open on the OneDrive website.